LAKEVIEW, Ore. - A collection of antique arcade and sideshow attractions displayed as the Jones Fantastic Museum at the Seattle World's Fair in 1962 was greeted as the beginning of a new tourist economy for this town of 2,700 in eastern Oregon's high desert country. 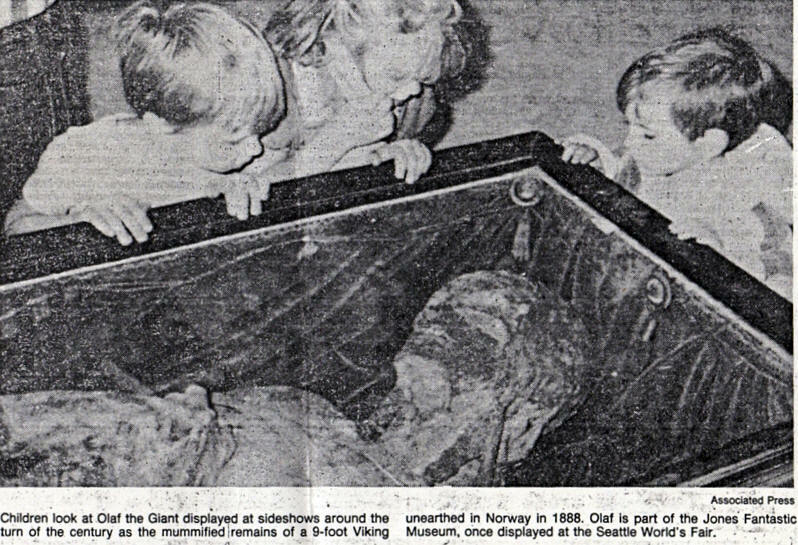 A convoy of 30 trucks driven by volunteers traveled to Seattle over the weekend to pick up the collection, including a 9-foot-tall mummified Viking, and to bring it to Hunter's Hot Springs Resort. Jim Schmit, a former Californian who got the idea for the museum, got tears in his eyes when he saw the people from this small ranching and logging town waiting to unload the convoy of semis and pickup trucks. "I've never seen people who were so happy to do something." Schmit said after he was greeted by cheers from about 40 people who waited through the afternoon at Hunter's Hot Springs Resort. "I guess I've just been around the big city too much. This just overwhelmed me." "Lakeview's a friendly place and if somebody needs something, they are there to help," said pharmacist Jim Howard. "The ceiling on my pharmacy fell in last winter and there was a group of people just like this working all day to help me." Schmit, a former Lake Tahoe, Calif., recreational property developer moved to Lakeview two years ago after deciding it fit his vision of the perfect small town in America. Schmit estimated it would have cost $25,000 to hire professional movers to carry the museum. Even with the convoy, he said some of the collection was left behind and will be picked up later. Schmit and partner Ralph Bothne, a Baltimore businessman, bought the museum from the Children's Hospital in Seattle, which had been given the collection. The collection has been in storage since 1973. Plans call for the Fantastic Museum and the rest of Schmit's collection to go on display this spring at Hunter's Hot Springs Resort, a mineral springs spa built in 1924 that includes a manmade geyser named Old Perpetual. Schmit sees the museum as helping Lakeview become a place people go, rather than somewhere they stop on the way to Reno, Nev. for the gambling. "If these people are half as enthusiastic in promoting tourism as they have been in helping me, it's got to be a success," Schmit said.